March 17, 2016-The Eastern New York Youth Soccer Association (ENYYSA) is clarifying the following implementation guidelines for U.S. Soccer’s Recognize to Recover Player Safety Campaign, specifically as it relates to concussion initiatives and heading for youth players. When a player deliberately heads the ball in a game, an indirect free kick should be awarded to the opposing team from the spot of the offense. If the deliberate header occurs within the goal area, the indirect free kick should be taken on the goal area line parallel to the goal line at the point nearest to where the infringement occurred. If a player does not deliberately head the ball, then play should continue. • Limited heading in practice for players in Under-12 and Under-13 programs. More specifically, these players shall be limited to a maximum of 30 minutes of heading training per week, with no more than 15-20 headers per player, per week. • Referees should enforce these restrictions by age group according to the specified rules. Referees will not be assessing the age of individual players on the field; they will enforce the rules for the age group. • Leagues and organizations are free to set their own standards, as long as the minimum requirements outlined above are met. US Soccer recommends that health care professionals be on site for major tournaments. The guidelines continue that an adequate number of health care professionals be present at all tournaments with 64 or more teams at Under-11 and the older age groups. Health care professionals are considered licensed professionals such as Athletic Trainer Certified (ATC) or Physician (MD/DO), with skills in emergency care, sports medicine injuries and experience related to concussion evaluation and management. 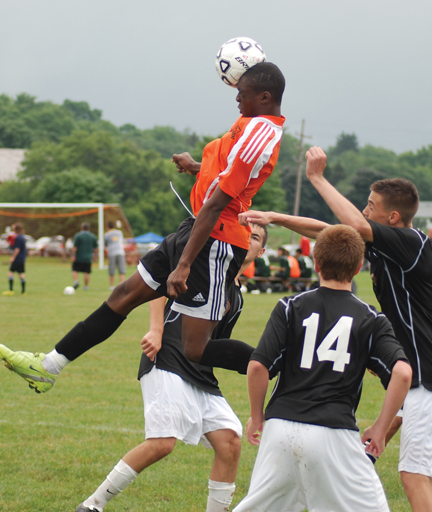 A PDF of the US Youth Soccer guidelines is linked here, which Eastern New York has adopted. Jim Eleftherion, Chairperson of Eastern New York’s Risk Management Committee and a member of US Youth Soccer’s Risk Management Committee, commented, “I’m glad that US Soccer has taken the initiative here but the medical people who have examined the whole issue agree that heading alone does not cause brain injuries or concussions. They are also caused by player contact or contact with the ground. It’s nice to see that US Soccer continues to be very concerned about player safety." Eastern New York and our 11 member leagues have announced a new concussion protocol as well since whenever a player’s head is injured, regardless of whether the collision was with an opponent, teammate or an object on the field such as a goal post, the safety of that player is of prime concern. Any youth player who is suspected of sustaining a concussion or injury in a practice or game shall be immediately removed. The new protocol states that if this takes place during a league or cup game, the player’s pass will be retained by the referee and submitted along with the game report and incident (supplementary) report to the league office. Should the suspected concussion take place during an Eastern New York sanctioned tournament, that player’s card will be obtained by the referee with a notion made on the lineup card. The notification of possible concussion form will be completed. The player’s card will be sent by the tournament director to the league office where the player is registered, along with the notification of possible concussion form, immediately after the tournament. The player may return to play only with clearance from a health care professional (licensed professionals such as ATC, MD or DO with skills in emergency care, sports medicine injuries and experience related to concussion evaluation and management). Once the league has received the medical clearance, the player pass will be mailed back to the coach via express mail, on the next business day, with a copy of the correspondence to the parents. Eastern New York's Pocket Concussion Card, given to coaches, refs and parents, is linked here as a PDF. The youth leagues within the geography of Eastern New York who are not affiliated with us have decided to adopt our well-worded protocol on concussions. Eastern New York’s new concussion protocol is in addition to the fact that coaches, referees plus league and club volunteers must pass a test on concussions when certifying and re-certifying for their Background Check every two years so they can be involved in Eastern New York sanctioned soccer games. With over 100,000 youth soccer players––both boys and girls––and more than 25,000 volunteers, the non-profit Eastern New York Youth Soccer Association (ENYYSA) stretches from Montauk Point, Long Island to the Canadian border. Members are affiliated with 11 leagues throughout the association, which covers the entire state of New York east of Route 81. ENYYSA exists to promote and enhance the game of soccer for children and teenagers between the ages of 5 and 19 years old, and to encourage the healthy development of youth players, coaches, referees and administrators. All levels of soccer are offered––from intramural, travel team and premier players as well as Special Children. No child who wants to play soccer is turned away. ENYYSA is a proud member of the United States Soccer Federation and United States Youth Soccer Association. For more information, please log on tohttp://www.enysoccer.com/, which receives nearly 300,000 hits annually from the growing soccer community.